Al Klusman and Jack Canaday put together an awesome vintage kart, the 1959 Chennery Sprint Kart, an exact replica of the kart that Bob Chinnery won the 1959 C-Open World Championships with. I consider myself very lucky to have been able to drive this kart at The Big One this past weekend. Being 6 foot 3, made it a real challenge to fit in this kart and actually use the steering wheel, but the kart was powerful and handled very well for a 1959 model! 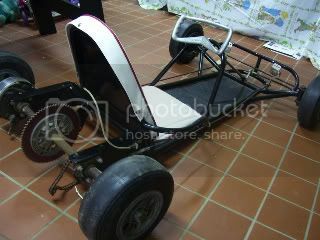 Vintage Karting items owned: simplex, Sprint, bug wasp, Dart Kart A bone, Sears Kart, Hornet lP2 Enduro. I sold this one but here is a picture of my old 1961 Chinnery Sprint. I realy miss this one. Bob only made 6 of this model. I've been trying to get in touch with Jack Canaday... can't find a home phone number or email. He built the replica, and had it on display at my Dads "museum" for several years. Dad passed about 8 years ago, my Mom followed him about 2 months ago... so we're left with a lot of his collection and this kart. I heard stories through the years that this may have been the last one he raced. Supposedly he headed off to a track in St Louis, and halfway there he heard it was a dirt track, not asphalt... and he hadn't packed his air filters... he raced anyway, but it didn't do well with the engines. Again, it's stories heard for decades... and I'm not even sure if this is the one... but Dad always rebuilt everything he put on display in his museum... but obviously this would be sold "as-is"... mainly for historys' sake.